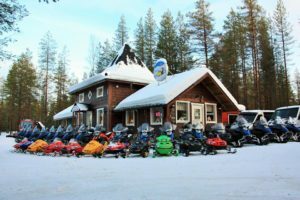 Arctic Circle Snowmobile Park Oy is a family-company, based in Rovaniemi in Finnish Lapland. The firm was established in 1999. We organize customized program services for individuals, especially for families and small groups. In winter season our office, located in Santa Claus Village at the Arctic Circle, is open daily from 9 a.m. to 5 p.m. for non-stop snowmobile safaris and mini-snowmobiling. With a booking our company organizes program services around the clock according to guests’ wishes.